Remy Human Hair Extensions Reviews. Cashmere Hair is the highest quality of Remy Human Hair. Remy Hair is considered to be the finest quality of human hair. With Remy hair, the cuticles are kept intact and not stripped, the hair follicles all go in one single direction. This preserves the hairs' cuticles and aligning them in a unidirectional fashion creates extensions that are completely natural in appearance. Remy hair is collected in a method in which all hair strands stay aligned in the natural direction as it grew (i.e. holding the hair in a ponytail and cutting), top at top, and ends at ends, to maintain the natural texture pattern and cuticle direction. This reduces friction between the strands thus reducing the tangling in the hair, commonly found in non-Remy or low quality hair. Remy hair appears more healthy, soft and silky. Remy hair is only lightly processed, and undamaged. Some companies claim to sell 100% Remy Hair, but are mixing anywhere between 10-40% Non-Remy hair into their packs. An expert in human hair can tell the difference between Remy and Non-Remy hair by touching it. It is said that Remy hair has a cool and silky feeling when you touch it. Non experts probably will not be able to tell the difference by looking at it. After 2 to 3 weeks of wear, when that hair starts to matte up you will know it’s not Remy. NOTE: All Human Hair tangles to some extent, and depending on the texture as compared with your one natural texture it could cause it to tangle. No human hair is perfect, that is how you know it is human. Hair that doesn't have a flaw is synthetic or at least has a synthetic mix. What is Double-Drawn Hair? Cashmere Hair is Double Drawn. Double Drawn hair is hair that comes from multiple donors. Time is taken to pick hairs from multiple donors so that the majority of the hair (about 80-90%) is the same length. This hair is more expensive than Single Drawn hair because it takes much more time to sift through the hair and match up the lengths. Remember, this is 100% Human Hair, it is not perfect (humans are not perfect, neither is their hair). How is it minimally processed, and what does that mean? Cashmere Hair is minimally processed. Our gentle CASHMERE dyeing process keeps the integrity of the hair at it's finest, giving you gorgeous color and long lasting hair. (Other brands use processes which rapidly dye hair using heavy acid and chemicals, causing damage to the hair.) Instead, our process of dyeing is a very slow process which is the least damaging to hair and gives you the healthiest quality hair, allowing your hair extension to look their best longest. We take the quality of our product very seriously, which is why we set ourselves apart from other companies on a completely different level of quality & authenticity. We have our strands laboratory tested and certified to be 100% Cuticle human hair, the highest quality available. We never need to mask the harsh chemical process by using silicone, because we don't use a harsh chemical process! (This technique is used to disguise the bad quality of the hair to make it feel silky when you first purchase it. After a few shampoos you might notice that the coating come off, and true nature of the quality is revealed. ) Cashmere Hair in NEVER silicone coated. Why is Remy Hair more expensive? You get what you pay for with Cashmere Hair. One indicator that you have Remy quality hair is the price. It is expensive & the price is constantly increasing. Remy hair extensions are beautiful and more natural, so they look like the individual’s own hair. It will cost more to invest in Remy extensions, the results achieved are far more stunning and long lasting than by using synthetic or lower grade hair. Remy hair extensions can be styled using flat irons or curling irons, just like your own hair. It is wiser to invest in high quality Remy hair that you can expect from Cashmere Hair because wear time & durability will last a longer than other brands. What makes Cashmere Hair clips different? Cashmere Hair uses the best clips. Sometimes underestimated, clips play an important role in the comfort, durability, and safety of clip-in hair extensions. No matter the quality of the hair, the quality of the clips play a major factor in the length of time you can wear your clip-ins, the comfort level, and how well they stay put. 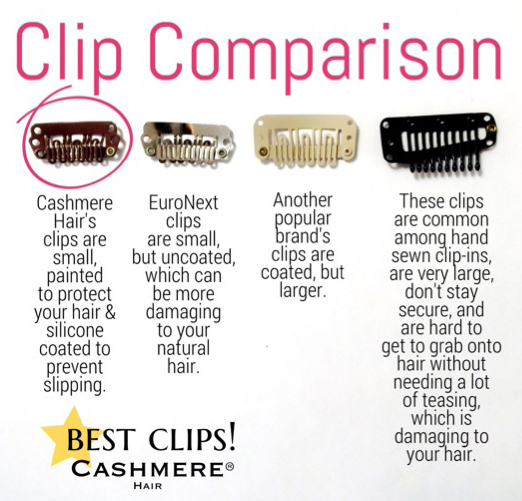 Cashmere Hair's metal clips are small, Silicone coated, and painted for maximum comfort & safety.